Dr. Ukata is a 1996 graduate of North Carolina State University in Raleigh, NC, with a Bachelor's of Science degree in Zoology. After completing his undergraduate degree, Dr. Ukata went on to attend New York College of Podiatric Medicine (the Pioneer in Podiatric Medical education) where he obtained a Doctor of Podiatric Medicine degree. After graduating from New York College of Podiatric Medicine, Dr. Ukata completed an intensive podiatric and surgical residency program at Wyckoff Heights Medical Center (an affiliate of Weil-Cornell University system) in Brooklyn, NY. Dr. Ukata has practiced alongside both internal medicine and orthopedic surgery groups in Sampson County since finishing his residency in 2004. 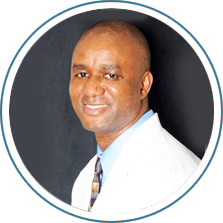 Dr. Ukata specializes in podiatric medicine and surgery, heel pain, ingrown toenails, diabetic foot care, and orthotics, and brings a wealth of experience to Garner and Kenansville, NC. Dr. Ukata is also affiliated with the Vidant Duplin Hospital in Kenansville, NC and Johnston Health in Smithfield and Clayton, NC.